Riding on the back of a Harley Davidson isn’t the first thing that comes to mind in the day of a 86 year old resident living within an independent living village – but for one lucky lady who lives at Peninsula Village, this was her reality. As part of the Village’s extra-curricular activities last month, Marion Anderson attended a high tea at Ettalong, held on behalf the Rotary Club of Woy Woy. The event was held to raise funds for ‘Lift the Lid’, Australian Rotary Health’s annual fundraising event for mental health research. 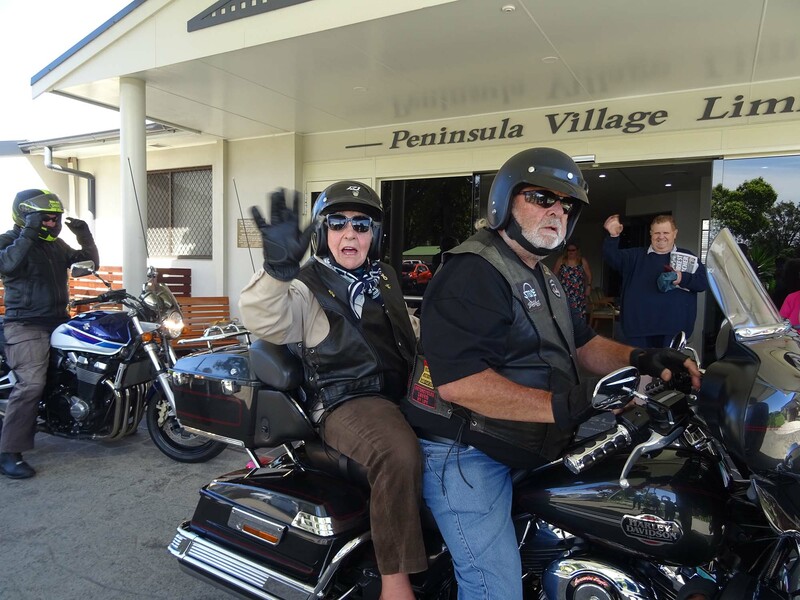 Marion was lucky enough to win one of the major raffle prizes on the day – a ride with the Ulysses Club, the largest social club in Australia for motorcycle enthusiasts and last week, she took off on this experience of a lifetime. Shane Neaves, Chief Executive Officer of Peninsula Villages spoke to Marion after her ride this November, saying she was absolutely thrilled by the experience. “It was heart-warming to see how excited Marion was on the morning of her ride. She really looked the part once she was geared up in her helmet, gloves and leather biker vest provided by members of the Ulysses Club,” said Mr Neaves. “It goes to show that age isn’t a barrier when it comes to being active and participating in the community. Marion is breaking the stigma around the perception of aged care and is a shining example for other residents at Peninsula Villages,” he added. Marion is an active member of the Peninsula Village community having lived within independent living for more than three years. “I was very happy to be a part of Rotary Club of Woy Woy’s high tea event, raising money and awareness for an important cause. Mental health is important to residents and the wider community. “While it was a huge surprise that I in fact won the prize and a very nervous morning to get prepared for the ride, I cannot believe how much I enjoyed it. “I would like to thank the Ulysses Club for donating the prize and of course for accommodating me on the ride. To feel the wind in my hair and enjoy a ride around the Peninsula was a truly memorable experience that I will continue to tell the tale of for many years to come,” said Marion.